I come from a family of hunters and gatherers, and the younger generations are no exception. My grandfather owned and operated a farm in Cuba, and to this day, enjoys reaping what he sows. This love of farm-to-table delicacies doesn’t end in the garden, either. Some of my fondest and earliest memories are of our family fishing trips. We’d each have our own special fishing chairs, and our rods would line the lake like saber arches, saluting the swimming fish. In the evening, dinner always included the catch of the day. Fortunately for me, I married someone whose family traditions also included spending quality time with a fishing rod in hand. Despite growing up clear across the country, my husband often shares stories about his experiences fishing with his grandfather. These days, I don’t spend much time fishing, but it remains a fun hobby and bonding experience for my dad and husband. They’ve traveled to Alaska together for salmon fishing, and often go to a local fishing club for a fun and lazy Sunday. Of course, when they return with their loot in tow, they turn to me to transform the scaly catch into something delicious. Much like my farmer grandfather I, too, love to utilize as much fresh produce and fish in my cooking as is seasonally possible. And as a young mother, I am always looking for shortcuts and time savers at dinnertime and especially Shabbat. 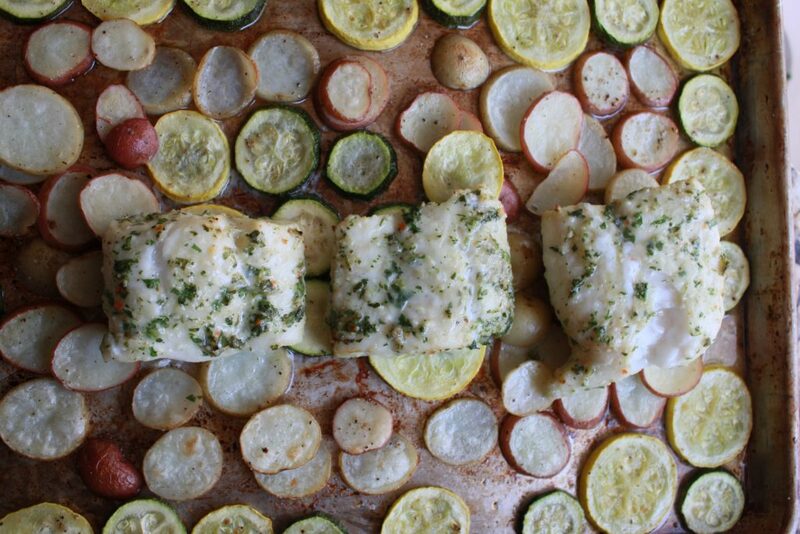 With that in mind, a recent favorite meal in my home has become my Sheet Pan Chimichurri Cod with potatoes and squash. 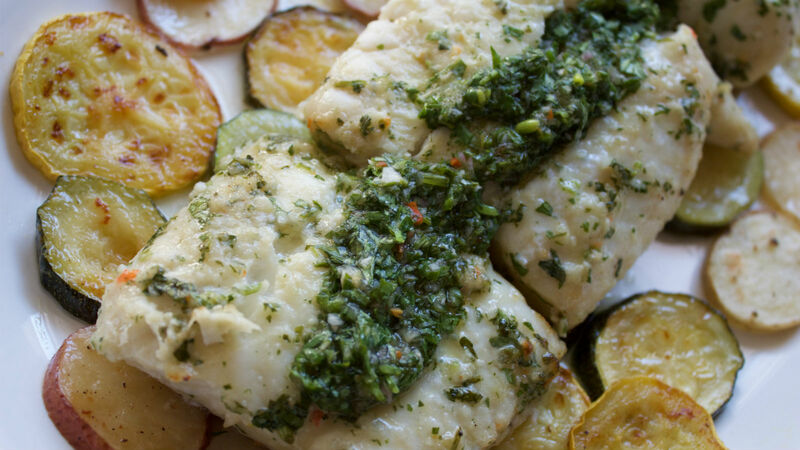 The fresh and pungent flavors of the herbed chimichurri sauce traditionally found on grilled Argentinian steaks, heightens the mild flavor of the cod filets, while the new potatoes and the zucchini slices mellow any heat that travels from the chilies in the dish. First, make chimichurri sauce. In a medium bowl, combine the vinegar, salt, black pepper, garlic, shallot and chili. Stir to combine, and let sit for 10 minutes. Add the parsley and oregano, and whisk in the olive oil. Next, preheat oven to 400 degrees. Add cod pieces and ¼ cup of chimichurri sauce to a zip top plastic bag, and seal to close the bag. Massage the bag to coat the fish with the sauce. Let sit in refrigerator to marinate, while you proceed with recipe. Cover a sheet pan in heavy duty foil (for easy clean up), spray with cooking spray, and add the potatoes, zucchini, and yellow squash. Drizzle the olive oil, and sprinkle with salt, pepper, and garlic powder. Toss to coat, and bake in oven for 15 minutes. Remove sheet pan from oven and stir the vegetables. Add the marinated fish pieces on top of the vegetables, and return to the oven for 15-20 minutes, or until fish is cooked through and flaky. Serve with additional chimichurri sauce. Crisp lemon vinaigrette, seasonal produce, and fatty charred salmon is a fabulous combination.